On any given day, more than 1 billion people use Google to find answers to the questions they have. In fact, the search engine has grown so popular that it processes more than 40,000 search queries every second. If you need to learn about anything, Google is the tool that connects you to the websites that answer that question. Unless you’ve been living under a rock, you’ve probably used Google at least a couple times in your life. And you’ve probably noticed that Google likes to guess what you’re searching by offering suggestions to finish your query. Sometimes these suggestions are helpful. Other times they’re not. Google uses the data from the billions of searches it processes every day to populate results and suggest the most popular questions being asked. 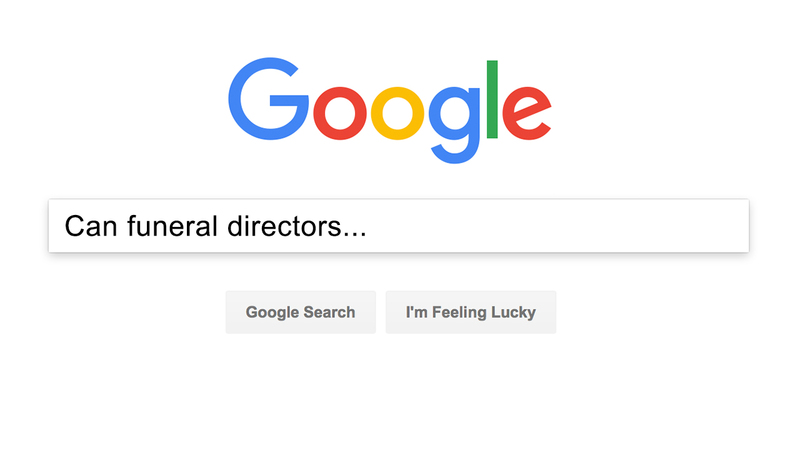 For this week’s blog post, we decided to answer the most popular questions being asked about funeral directors on Google. Simply put, yes. In order to work as a funeral director, a prospective candidate must complete a certain level of education, complete an apprenticeship, and pass a licensing exam. Although the specifics of these requirements vary by state, for the most part, they adhere to similar requirements. In most states, a funeral director must earn at least an associate degree in mortuary science from an accredited college or university. Some students choose to enrol in specialized mortuary schools that offer additional courses and certifications that other colleges do not. While attending school, students learn about embalming, operating a funeral home, and much more. Certain schools offer certifications and additional training programs for celebrant services or operating a crematory. After graduation, students must then enter the profession as an apprentice. Depending on the state, the length of apprenticeship can vary from 1-2 years. Finally, once an apprenticeship and formal education have been completed, the funeral director must pass a licensing exam to work in a specific state. Should they choose to move to another state, they may be required to pass another licensing exam for that state. In order to maintain their license, funeral directors are required to complete continuing education credits each year. If they fail to do so, their license may be suspended or revoked. Why are funeral directors called undertakers? Many people believe that funeral directors are called undertakers because they place the body underground. However, this is a common misconception and not the reason behind the term undertaker. The term undertaker dates back to the late 17th century. During this period undertaker referred to anyone who would undertake the responsibility for a task. Funeral directors during this time were called funeral undertakers. Funeral undertakers were responsible for undertaking the care of deceased and laying their bodies to rest. Eventually, funeral undertaker was abbreviated to just undertaker. As this happened, other professions and trades stopped using the term and it became solely related to funeral professionals. Today the term undertaker is interchangeable with funeral director or mortician each of which all mean the same thing. Do funeral directors make a lot of money? A popular question among consumers is how much money a funeral director makes. Anyone who has ever paid for a funeral or cremation service knows that the price can be as low as $1000 dollars to more than $10,000 depending on the type of service, products, and funeral home you work with. What is surprising though is funeral directors make less than you might think. Much like the cost of services vary, so does a funeral director’s salary. In 2017, the average salary of a funeral director was $54,700. Depending on your level of experience, training, and years working in the industry, a funeral director’s salary has quite the range. For instance, a new funeral director fresh out of mortuary school might start at an annual salary around $27000. A funeral director with many years or experience or in a management position could earn as much as $84,000. If you own your own funeral home the profits can be even more. Again, it all comes down to a number of factors like your service costs and the number of services you conduct in a year. Some funeral homes might only do 20-30 services a year whereas others will do hundreds. This all impacts how much a funeral home owner will make. This can be a tricky question to answer because it all depends on the circumstances. Simply put, yes and no. If you are wondering if a funeral director can keep the ashes until your family has paid, the answer is no. This is because in most cases, a family pays for the services before they take place. It happens more often than you think but sometimes people don’t return to the funeral home to pick up their loved one’s ashes. Whatever the reason for this, the Cremation Association of North America estimates that there is about 2 million unclaimed cremated remains being stored in funeral homes across the country. Legally, most states require the funeral home to store the remains for anywhere from 60 days to 4 years before the funeral home can scatter the ashes and get rid of them. In most cases though, the funeral home will store the remains for years while trying to contact relatives of the deceased. This entry was posted in Funeral Advice on June 21st, 2018 by ObitTree .